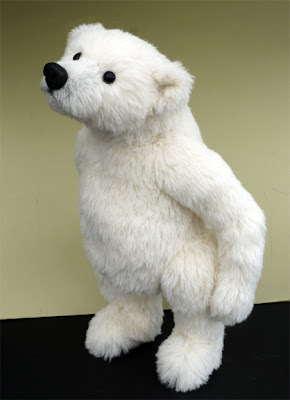 I have just finished this large, 22 inch polar teddy bear, ready to take to Hugglets two weeks tomorrow. I am really pleased with this design...a fusion between teddy bear and realistic bear. 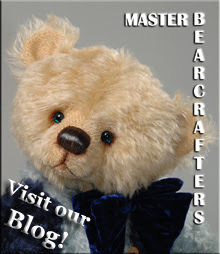 He is made with beautiful, soft Steiff Schulte white alpaca. His paw pads are appliqued and trapunto stuffed. 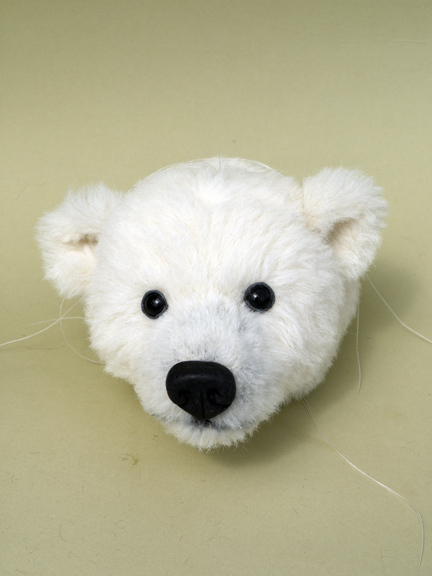 I may now need to go back to smaller teds as working with heavy wire armatures and stuffing large bears is playing havoc with my tennis elbow, my wrists and hands! 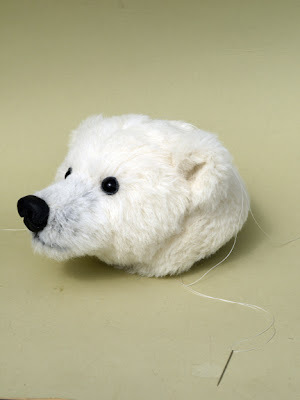 Bear making is in full swing chez Teddybuys. After the euphoria of finishing TWO bears for Hugglets last week, I've made some changes to my head design to create a new polar bear. Actually, the head is as far as I've managed to get so far! He is going to be another big one. I can't resist polar bears. They are one of the most difficult bears to 'give a personality' because of all the white fur...but I cannot resist trying. 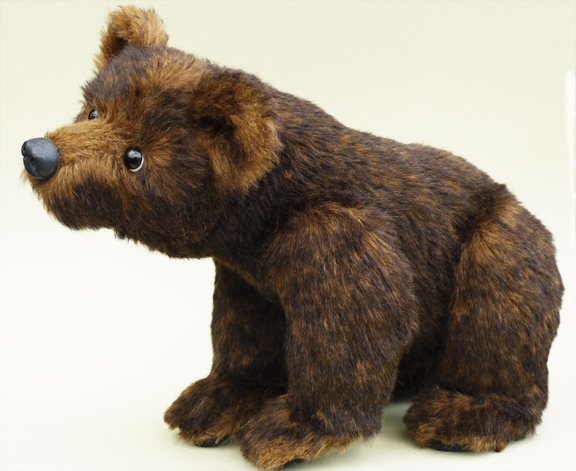 This chap is being made using gorgeous, Steiff Schulte alpaca. Wow, two updates in two days! No, I really cannot make bears that quickly! Whisper has been sitting on my worktable waiting for a head! 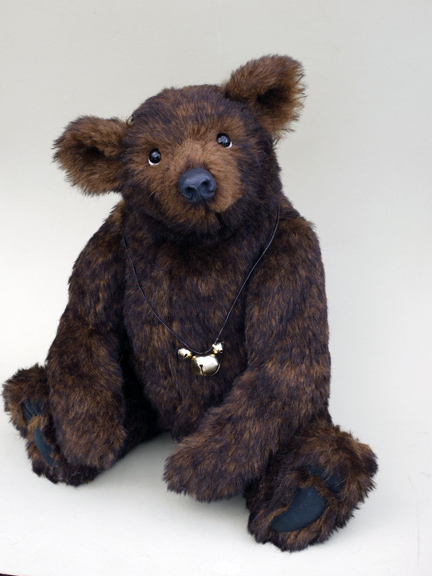 She is a brown bear cub made from the same alpaca as Max. She has been designed to stand on all fours. She has a double neck joint and nut and bolt joints in all four legs. Her limbs have a strong wire armature, allowing her to stand in a number of different poses. Her nose has been sculpted by myself using epoxy clay. I have tried to capture the appearance of a vulnerable, young cub. She will be coming to Hugglets with me on the 8th September. She has been adopted, so will not be coming to Hugglets. I have struggled to come down to earth after all the excitement in July. A delivery of my favourite tipped Helmbold alpaca arrived while I was away. I have completed the largest bear I have made in years. His name is Max and he is about 22 inches tall. He has a sweet, gentle personality to go with his large size and can stand on his own if posed carefully. Max will come with me to Hugglets if I can get him into my cases! 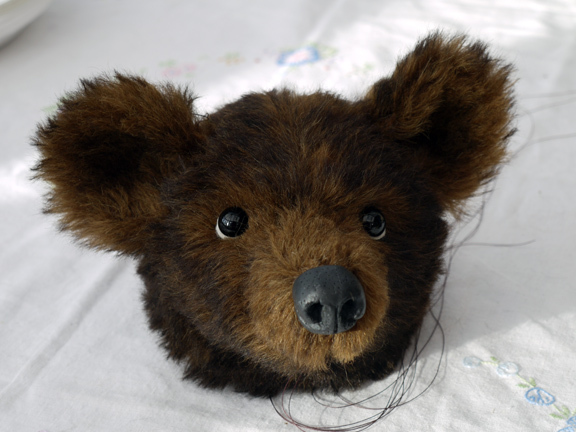 I have an all fours bear nearly finished and am busy dyeing mohair for my little, whimsical teddies. The wedding is over...the honeymoon has come and gone, my birthday will not happen for another 364 days...so no more excuses. It's time to get back to reality!